Curtains can be hard to choose, depending on the room you want to install it. However, if you know what you need them for then it can be easy narrowing them down to some simple features like light reduction and noise reducing curtains. Some of the best noise reducing curtains is designed in a manner that they can offer soundproof capabilities without compromising on its design as well as style. Most soundproof curtains also have other features that work in conjunction with each other to provide you with a relaxed atmosphere. Do Soundproof Curtains Really Work? What to Look for While Buying Soundproof Curtains? So, are you looking to reduce the noise level in your home, then it is time you buy some noise reducing curtain for a proper relaxing atmosphere. However, if you are lost on where to start, you can opt for one of the seven listed below for a perfect soundless room setting. Most are affordable and easy to care for and maintain. When it comes to reducing noise levels, nothing really works its magic like a soundproof curtain. It can make the noise seem like a beautiful song by muffling it or reducing it. Besides, it depends on the kind of noise being reduced or its level in the surrounding space. Soundproof curtains often work to a certain level. As much as they do not reduce the noise completely, they ensure that it is harmonious in that it does not echo all over the room. This means that they can provide a peaceful relaxed atmosphere for you to work in or for your baby to sleep in. Some of the best noise reducing curtains often cover window to window and can go up to the ceiling to reduce the noise to a certain level. The more it covers the windows and some added space as well as the floor to the ceiling the better it will be at muffling the intrusive outside noise to a higher level. So they do work to a certain degree but they will not completely soundproof the room, but only make the noise seem like white noise, peaceful and serene for you to easily fall and stay asleep or work with. You just have to ensure you buy the right one in terms of space coverage as they do work the same. The thicker and longer it is the better it will work. This is one of the best soundproof curtains as it can easily filter up to 70% of sound for a restful and peaceful surrounding. Besides, it is made from eco-friendly materials that make it perfect for babies, elderly and even late workers or shift workers. They are also free from vinyl. Apart from being a noise reducing curtain it can also block out 95% of light and prevent the infiltration of 100% ultra-violet rays. Moreover, these soundproof curtains are made from heavy durable materials that help in preventing heat loss. Available sizes - W42 L63, W42 L84, W52 L63, W52 L84, W52 L96, W52 L108. Available in 19 different colors. It comes packed in twos with each measuring 42 by 84 inches. Each soundproof curtain has six stylish grommets with a 1.6-inch inner diameter. The grommets are conveniently designed to fit very easily in any decorative or standard curtain rod in whichever room. As for maintenance, you can always machine wash it, tumble dry low and maybe warm iron it if needed. Do not use any chlorine bleach, if you have to use bleach. So, are you looking to improve your working or living space by making it less noisy, then it is high time you opt for these soundproof curtains. They are durable, functional and affordable given their features. This soundproof curtain comes in twos, with each noise reducing curtain panel measuring 52 by 84 inches. It has a touch of elegance that is enhanced by its eight silver grommets that have an inner diameter of 1.6-inch each. Moreover, this soundproof curtain can also block light for up to 99%, offering you the needed level of privacy for a peaceful working or relaxing environment. This is because it also has blackout features. Available sizes - 52"W x 18"L, 52"W x 24"L, 52"W x 36"L, 52"W x 45"L, 52"W x 63"L, 52"W x 84"L, 52"W x 95"L.
Available in 16 different colors. Besides, it can also save you energy costs due to its thermal insulation capabilities that can keep you cool and warm all year round. Likewise, these noise reducing curtains are also resistant to fading and are wrinkle-free. It has the same kind of color and texture on both sides for added durability and style. You can machine-wash it with water of up to 86°F. Use a mild detergent and never try to bleach it. As for ironing, you can iron on low temperature. Moreover, you should keep sharp object far away from it as they can damage its fine fabric. These soundproof curtains can reduce noise level with up to four folds. This is because it is made from patented 3-in-1 technology that combines 100% of polyester on the first layer, with 99.99% of polyester as well as 0.01% aluminum on the second layer and 100% genuine cotton as its third layer. This soundproof curtain can also save you up to 37% of energy as it can keep you very cool and warm in summer and winter cold respectively. You can rely on these noise reducing curtains to provide 100% of blackout from sun rays and UV rays. Available sizes - 57"W x 63"L, 57"W x 84"L, 57"W x 95"L, 57"W x 108"L.
Available in 13 different colors. Material type - polyester, aluminium, and cotton. Moreover, it is sold as a single panel measuring 57 by 84 inches with rust resistant grommets of 1.6-inch inner diameter for easier installation. Likewise, its grommets are evenly spaced at regular intervals to prevent the fabric from crimping. 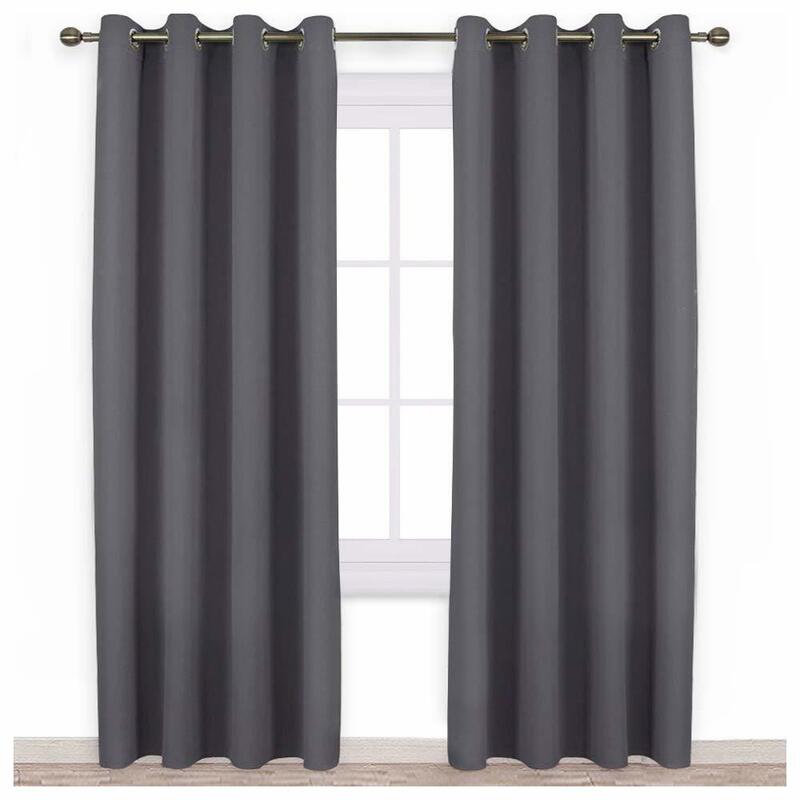 This elegant curtain has a very discreet and unique stitching and seams that make it highly adaptable to doors as well as windows. Besides, you can always adjust it to whatever length you want. So, improve your home with one of these soundproof curtains. It comes at an exorbitant price but it functions as required and can last many years if properly maintained. You can only dry clean it. This soundproof curtain can prevent the intrusion of outside noise to an acceptable level. It can also reduce the level of light intrusion by 76% and prevent harmful UV from causing harm to you and your décor by up to 89%. This is all due to its triple-woven fabric-tech construction that styles it with the above features. This noise reducing curtain has eight sewn-in copper grommets that can fit a curtain rod of up to 1.5-inches due to its 1.6-inch inner diameter and 2.3-inch outer diameter. Available sizes - 52"W x 18"L, 52"W x 63"L, 52"W x 84"L, 52"W x 96"L.
Apart from its noise reducing capabilities it can also keep you warm and cool during the year when the climate shifts from summer to winter. This soundproof curtain is sold in twos, each pair measuring 52 by 96 inches. It is safe for use in baby’s room, living room and even master bedroom. You can rely on it to provide the perfect working or relaxing indoor environment for a peaceful work-at-home experience. It is made of 100% durable fine polyester fabrics that can be machine-washed with a mild liquid form detergent. Do not use any bleach or hot water when washing them. You can warm iron it for appearance sake. This is one of the best noise reducing curtains in the market as it can keep outside noise to a minimal level for a peaceful and relaxed environment. You can use it in baby’s room, living room and any other room that require minimal noise and even light. It is made of 100% polyester with the front and back colors being the same for enhanced durability as well as elegance. The same fabric components also make it energy efficient and easy to care for. You can rely on it all year round to keep you warm and cool even with the changing weather conditions. Available size - 52’’W x 84” L.
This noise reducing curtain is sold as a single curtain, measuring 52 by 84 inches. It has eight lovely grommets that make its installation and use very easy. Each of its grommets has an inner diameter of 1.6-inches. It can offer you with the needed privacy far away from intruders’ prying eyes. This noise reducing curtain can speak volumes for your living room or bedroom. It is simple, yet sophisticated in a fashionable way. It can last for some time without going out of style. You can machine wash for maintenance and care. This noise reducing curtain offers you a year-round of spring as it can effectively help in the maintenance of temperatures indoor as well as reduce 70% of UV light and heat, especially in the summer. It can also prevent winter cold by up to 60%. Besides, it cuts off noise level by 15-25dB. Moreover, these noise reducing curtains can also offer light shading of up to 90% and dark shading of up to 99%. It has the same color on both sides enhancing its appeal and general outlook. This soundproof curtain is sold in one single panel measuring 52 by 63 inches. It has eight grommets for easier installation and sliding. You will also get back ties of the same material for the easier hold up when you want some outside light. 8 metal grommets per panel. This curtain is made from an eco-friendly material with zero formaldehyde, non-toxic odor as well as zero chemical coating. You can machine wash it with cold water for cleanliness and maintenance and tumble dry. In case you want to iron, make it a quick one, you can also steam clean it. So, do you want a curtain upgrade, this one here is the best option for a soundless atmosphere. This is one of the best noise reducing curtains as it can reduce the level of noise from outside without affecting any of its design or outlook. You can rely on it to provide a certain amount of blackout by preventing up to 95% of light from invading your home and spoiling your décor. Besides, it has the same material as well as color on both sides, with zero liners. These soundproof curtains are sold in pairs of two with each curtain panel measuring 42 by 54 inches. It is made from 100% polyester and comes in navy blue. Moreover, it has 3-inch rod pocket tops that can fit almost every standard home curtain rod without any issue. Available size - 42"W X 36"L, 42"W X 45"L, 42"W X 54"L, 42"W X 72"L.
Material type - Polyester & Polyester Blend. Available in 11 different colors. The item is machine and dryer washable. It is multi-functional and can save you loads of energy expenses due to its thermal insulation features that keep your home warm and cool all four season of the year. Besides, it can offer you with the required level of privacy whenever possible. You can hand-wash it with non-chlorine bleach or machine wash it, then tumble dry low and iron on warm. It is durable and one of the best soundproof curtains going at an affordable rate. So, is the noise too much, do you need to silence it a bit, then you should try some of these soundproof curtains listed above. They are eco-friendly, durable and most of all affordable given their quality fabric and featured capabilities. Curtain Length: Should Curtains Touch the Floor?